Hope Hunter has a simple goal: she wants it all. It’s not greed; she just believes a professional woman should enjoy both a successful career and a fulfilling love life. At least, that’s what she used to think. Now she’s not so sure. A few months ago, Hope’s life was coming together beautifully. A recent MBA graduate, she ran the venture capital division of a world-class Chicago ad agency. Her husband, David, was wonderful, and her life seemed, well, perfect. 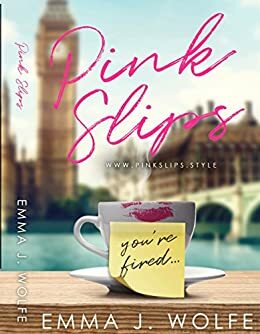 Things start to go wrong when Hope accepts a job as CEO of Pink Slips, a digital startup pushed by her brother-in-law, Joel. Something isn’t quite right about Pink Slips, but by the time Hope puts her finger on what’s wrong, it’s too late. With her marriage ruined, her professional future in jeopardy, and a passionate encounter with the handsome Rob Adler still on her mind, Hope relocates to London, England, where she meets the inaccessible Jeffrey Davis. There, she hopes to decide if it’s worth fighting for the Pink Slips job and whether Rob or Jeffrey has any place in her life. To all the men who have betrayed her trust, she is ready to say #Enough Already! An entertaining look at the difficulties and rewards of juggling work and romance, Pink Slips is the first book in the Hope Hunter Chronicles. I loved this book. The plot, character development and settings were extremely well written and believable. Hope Hunter, the main character, is a woman you want to succeed. Unlike most characters in this genre, she is not a stereotype. She is a fully formed human being with lots of charisma, vulnerability and smarts and knows how to use these gifts to her advantage. Whether it’s bouncing back from a devastating career loss or juggling the men in her life who fall in love with her, Hope Hunter knows how to navigate life. I found it really fun to be on her journey. I had a hard time putting this book down. I can’t wait to read her next adventure. A must read for savvy women who are eager to have it all! Hope Hunter's journey through success and love captivated me from page one. I didn't want to stop reading as I found myself connecting with Hope's passion for life and her drive to continuously catapult herself forward in her career. The complexities of Hope's relationships coupled with many unexpected twists and turns in her career path made it easy for me to root for Hope's happiness. An energizing and inspiring read...two enthusiastic thumbs up from me!